So how can you capture this business? By making the Unico System a part of your business plan. We’ve lauded Unico before for offering HVAC system that can be installed in nearly any home regardless of age or layout. When it comes to antique and custom homes, an obtrusive register can be a real pain point. To ensure that their system fits in every home, not only literally but aesthetically as well, Unico has designed an entire series of designer air outlets. Before we jump into all of the options, let’s cover the basics of Unico outlets. 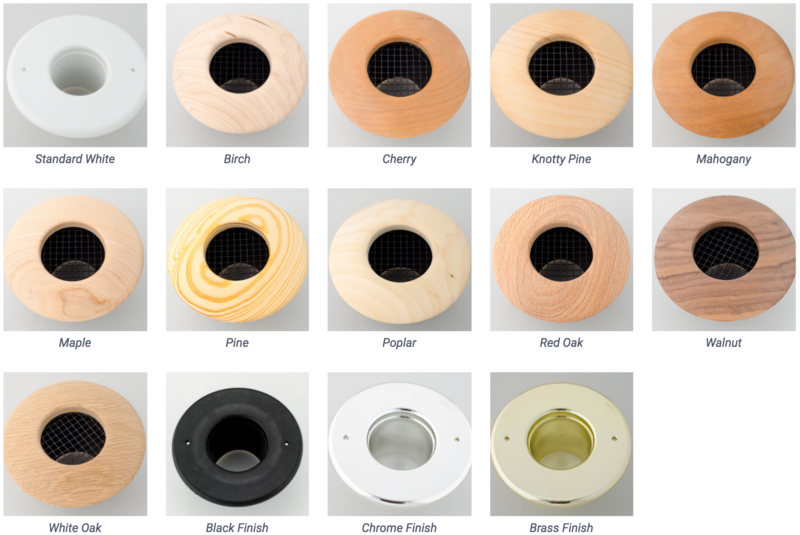 Unico has two styles of air outlet: round and slotted. Both are compatible with 2″ supply tubing and the round options are also available in 2-1/2″ sizing. For the round outlets, the 2″-supply model has a 4″ opening and it supports 30-35 CFM of airflow while the 2-1/2″-supply model has a 5″ opening and can manage 40-45 CFM of airflow. A round outlet with a fire rating of one hour is available for application requiring such components. All round outlets can be installed in floors, walls, and ceilings. For sloped ceilings, 15-degree and 25-degree plastic models are available. Unfortunately, custom finishes are not available for slanted or fire-rated outlets but these models can be painted to match the ceiling! In fact, any plastic Unico outlet can be painted, just be careful to keep the opening clear. The slotted outlets have an 1/8″ slot for airflow and a recommended CFM of 30-35. They measure 1/2″ x 8″. Slotted outlets are available in 90 degree or straight orientations. Unico’s slotted outlets are typically plastic, but they offer an aluminum 90-degree slotted outlet for applications that do not allow for plastic duct components. A slotted Unico outlet can be installed anywhere in the floor, ceiling, or walls of the home, making it easy to find the perfect spot for every outlet. As you can see above, there are over a dozen different options for your customers to choose from. Slotted outlets are also available in all of the above finishes and colors. As mentioned above, the standard white outlets can be painted to match your customer’s home. Not pictured is an unfinished wood outlet. These outlets can be stained and finished to the customer’s specifications for a truly custom option. Since the Unico System can be adapted to nearly any space and installing one requires precious little renovation, it can be pitched to pretty much anyone. While older homes, new constructions, and custom jobs are probably where you’ll meet the most clients for whom design is a sticking point, it’s always good to have something in your back pocket. You never know when offering a unique opportunity will pay off big.